Few are aware of this, but only less than 3% of the UK money supply is £ credits issued by the Bank of England on behalf of the UK Treasury. Over two thirds of the £ credits which constitute the UK money supply was created privately by banks to back mortgage loans, so that the majority of UK bank deposits are based on UK land. This fact makes it difficult to separate a Scottish monetary and fiscal system from the UK without the permission of Westminster. But in considering a Scottish monetary system, in addition to the value of land and buildings, there is also the value of goods and services, the value of machinery, technology and (increasingly) of knowledge, data, and other forms of intellectual value. Above all, there is the value of energy, and this proposal to energise Scotland’s economy through the introduction of the Energy Credit Obligation (ECO) is based on the simple fact that while the value of land use is by definition locally acceptable, the value of the use of energy is global. In other words, energy knows no nationality and no borders. The ECO will not compete with the existing UK system, but will be complementary to it, being implementable now with no change in UK law. There are two strategic trends driving the evolution of modern economies: increasing energy intensity & the evolution of smart markets. The former Saudi oil minister Yamani observed that the Stone Age did not end because of lack of stones, and that the Oil Age will not end for lack of oil. Whereas 30 years ago one barrel of oil fuelled the production of over 35 barrels, now the ‘easy’ oil has been extracted, and a barrel of oil may now be needed to fuel the extraction of 5 barrels or even less. So while energy intensity of oil & gas production has increased, the Energy Return on Energy Invested (EROEI) has declined to the extent that the oil price has reached a level at which it is increasingly unaffordable, affecting demand. Moreover, it is increasingly economic to substitute oil with renewable energy, and to reduce oil use through smart interventions in energy efficiency (the Fifth Fuel). The outcome of this secular increase in energy intensity is that the global $ oil price is effectively capped. Why else would Saudi’s Aramco and Russia’s Rosneft be prepared to sell equity ownership? They would never do this if they expected oil prices would continue to rise. The current energy market is a transactional commodity market where energy is produced, bought and sold to consumers by middlemen such as oil companies or the Big Six, with a view to investor profit. Finance capital typically takes the form of equity (shares in a joint stock company) or debt (bank credit based in turn on bank equity capital). For two decades, we have seen direct instant ‘Peer to Peer’ connections increasingly bypassing middlemen who have adapted by changing their business model. There is a transition to services driven by a very simple economic rationale. While owning assets and taking market & credit risk ties up a lot of finance capital, to provide services requires only ‘smart’ intellectual capital – knowledge, know how & know who. For service providers it makes commercial sense to share assets, costs & risk wherever possible and to compete only on quality of service. However, the fundamental structural problem with the emerging Sharing Economy (exemplified by Uber and AirBnB) is that landlords, banks and above all shareholders don’t share. No-one consumes raw energy in physical commodity form such as oil and gas. What we actually use is “Energy-as-a-Service”- dynamic energy delivered over time, such as heat/cooling, power, mobility, electromagnetic radiation & light. Following the 1973 Oil Shock, when the oil price rose by 400% from $3 to $12 per barrel, Denmark (with an economy > 90% reliant on oil) faced an existential threat and implemented a new bipartisan energy strategy in order to achieve energy resilience, security and independence. The organising principle of Denmark’s resilience-focused energy strategy was that for any given use of energy as a service, the Danes would minimise consumption of oil as a commodity. Denmark therefore invested massively in renewable energy such as wind (creating a global leader, Vestas, founded on Scottish technology), in heat & power infrastructure (again building huge expertise and a technology base); a switch in mobility to cycling and efficient public transport; investment in buildings and so on. In other words the Danes put energy cost before financial cost. 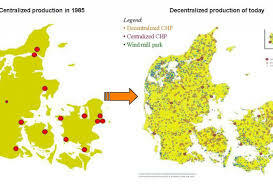 The following image strikingly illustrates how this organising principle transformed Denmark’s energy infrastructure from a centralised National Grid, in 1990, to an emerging distributed Natural Grid in 2014. What about the economic outcome? Surely this massive infrastructure investment – which broke all the conventional market rules – must have wrecked Denmark’s economy? In fact, while Denmark’s GDP has more than doubled since 1973, the Danes’ energy use declined and carbon fuel use declined significantly, which in turn – as an unintended consequence – reduced Denmark’s CO2 emissions. So Denmark demonstrated in practice that to apply a strategic organising principle of least resource cost leads not only towards national resilience, energy security & independence but also to a transition to a low carbon economy. However: Scotland is not Denmark. Denmark was able to achieve this transformation firstly because energy utilities were publicly owned, and secondly because Danish local government is not only more local than in Scotland but also was well resourced fiscally through land value taxation (but note this source has been diluted). Denmark was therefore able to deploy public capital, directly and indirectly (eg through guarantees of bank loans to Coops) to infrastructure which would not have been financially viable using private finance capital of debt and equity and the Nordic commodity market in energy which has since emerged..
Scotland has very different institutions to Denmark: our councils are regional, not local: our energy utilities are in private not public hands; and in any case, energy policy is reserved to Westminster. So Scotland needs innovative institutions and instruments to mobilise resources and moreover, it must be possible to implement these bottom up with little or no change in the law. But how? Enter Financial Technology (Fintech). The current wave of new data sharing/authenticating protocols between machines (Blockchains) and financial instruments (Coins such as Bitcoin) have emerged completely outside the existing economy and have created what is clearly a financial bubble, akin to the historic South Sea Bubble and the more recent Internet Bubble. In the same way that modern online businesses emerged from the Internet bubble, we are now seeing Fintech evolve as this new digital layer is integrated with the real world economy, and nothing is more real than energy. This proposal to energise Scotland brings to bear innovative legal design of the institutions and instruments which – Back to the Future – pre-date the modern economy. An ECO credit instrument is simply a promise issued by an energy producer in exchange for value received from an acceptor. An ECO holder has no right to demand payment in £ sterling, so it is not a debt instrument. There is no right to demand delivery of energy, so an ECO is not a derivative (forward/futures) instrument. The ECO confers no right of ownership such as a rent or dividend, so it is not an equity instrument. Finally, it is not purely an authenticated receipt or proof of value received or expended without any additional obligation – so it is not a Fintech Coin instrument like Bitcoin. The obligation of a supplier of energy services who issues an ECO is simply to accept this instrument in payment for his energy supply So if a customer presents an ECO instead of (say) £ sterling this will be valid payment for energy supply and an authenticated ECO cannot be repudiated, and £ sterling claimed instead.. There is nothing new about promises as a means of payment: this instrument pre-dates all others and has been routinely in use for millennia wherever people trust each other. Promises/credits form the unseen foundation of all economies even today. Historically, governments and banks have been the institutions which acted as intermediary organisations to provide the trust which is necessary for the creation, exchange and fulfilment of promises. This reality is embedded in the English language so that Tax Return refers to the return and cancellation of sovereign tax credits; Rate of Return to the rate at which promises may be returned to the promissor, and Stock refers to the split tally stick wooden tokens which recorded promises. The question is what are the future Scottish risk, cost and surplus sharing institutions which will provide a framework of trust for the ECO. A Local Energy Company is not an organisation – there are enough of these already – it’s simply an agreement between existing local stakeholders to create new energy infrastructure.- a local Natural Grid. The aim of an LEC is energy independence (and hence, energy security and resilience) for a locality. As with all pre-1855 Companies – particularly those incorporated to build civic infrastructure – these Companies would not have limited liability the reason because with all stakeholders as members there is simply no need to limit liability. Neither would the Company have share capital, because any necessary investment is raised by selling energy credit obligations (ECO) to investors to create energy loans. There are three stakeholder associations/clubs: energy users & producers (who use the energy infrastructure); energy investors; energy service providers (developer/managers). In addition there will be custodian members. Energy service users and investors delegate development & management, while retaining veto rights of governance. The ultimate veto, is held by custodians in the public interest so that infrastructure is held in common in perpetuity. In this participative governance model, no stakeholder has dominant rights to impose his will on others and for that reason I call such an agreement a Nondominium. The LEC agreement shares costs and surplus, particularly from development of new assets. It also shares risk through a mutual guarantee with shared (Fintech) accounting/clearing of acceptances by one supplier of ECOs issued by another. There is nothing new about such associative agreements: Scottish farmers innovated machinery rings and now compete on quality but collaborate on costs. Ship-owners have clubbed together globally for over 140 years in Protection & Indemnity (P&I) Clubs to cover risks that the insurance middlemen of Lloyds of London will not take. And so on. What is the role of banks in such an energy market system? Since banks are not energy suppliers they cannot issue ECOs, but there are two important financial services which banks can provide: firstly, as risk managers overseeing ECO issuance and clearing and secondly, in advising and bringing ECO energy investors together with ECO energy loan investments, both for new and completed assets..
Local Energy Companies may be networked through membership of Energy Companies covering a greater locality: so by way of example the Linlithgow Energy Company would simply be a member of the West Lothian Energy Company and so on. LECs may be founded and incorporated at any time, and are complementary to the existing fragmented and commoditised energy market. ECO energy credits are independent of location; implementable bottom up, rather than top down; have no nationality; and lead directly to energy independence and an energy economy. Scottish economic decisions made on the basis of least resource cost rather than least £ cost will lead to the creation of a Scottish Natural Grid. As energy services markets spread by local implementation, it leads to a broader international Natural Grid as the energy market evolves from a transactional commodity market. However, while focusing exclusively on objective energy cost may be the dream of technocrats, it leads to nightmares for everyone else. So while score should be kept of finite physical resources in objective energy terms, the minimisation of human cost and the maximisation of happiness, beauty, care and amenity requires subjective measures. So we shall also need new Scottish institutions and instruments to mobilise relationships between Scots, and between Scots and the land in which we live: that is another story, of Scottish housing, food, care and health services and independence. We need more of this kind of well researched and plausibly argued pieces which challenge existing economic and financial paradigms. So much of the (largely mendacious) counterarguments of the Better Together side were predicated upon a particular economic model, and, allegedly, because Scotland is too wee and no very good, we would be unable to manage it without Westminster’s help, and, alternatives like this and matters of land ownership, are simply swept aside as, ‘too silly’. Bella and the other sites have done a great service these past 5+ years in providing a platform for such alternative views and for the opportunity for a good discourse by the readers. Pie in the sky, flying pig etc etc! Try going up to your supplier and saying the promise to supply does not need to be paid in £ GBP. The privately owned estates who have jumped on the hydro and wind farm bandwagons are only in it for one thing. And we the consumer pay abnormally high rates to subsidise their investments. The SNP won’t change that. They are bought in to dhow their green credentials at our expense! Firstly, an ECO is not a promise to supply, it’s a promise to pay for supply if and when delivered. No energy supplier could refuse to accept their own promise to pay and sue in court for £ instead. Secondly, the Big Six already routinely issue energy credits to Food Banks, but they price them in £, which means the fuel poor who are obliged to use these credits will find they cover different amounts of energy depending on their tariff. An ECO would pay for a fixed amount of energy, irrespective of the price. If an energy producer enters into such an agreement the bargain starts with an agreement or promise to supply. Otherwise why issue such an instrument? And if you can find me an energy supplier who is prepared to accept anything other than hard currency let us all know. I am sure I have a load of buttons just sitting waiting to be promised. An ECO represents prepayment for energy. It is not necessary for an investor in an ECO issued by a supplier to have a supply agreement, when he may simply sell the ECO at the best price below the market price to a consumer who does have a supply agreement either for immediate redemption or to hold as pre-payment. Suppliers will mutually accept ECOs issued by other suppliers and clear balances within a mutual guarantee (P&I Club) agreement and the outcome will be an Energy Clearing Union. The value proposition for an energy supplier is that ‘Energy Loans’ in ECO provide them with a form of funding which wipes the floor with the conventional market paradigm of (Joint Stock) Equity, Debt and Derivatives. The value proposition for an investor is a direct investment in a financial asset which is likely to hold its value against inflation. I’m happy to field any other questions provided they are made in a civil manner. Why would the investor do that? Not if he is going to sell at below the market price it wont! As you say Scotland is not Denmark, furthermore electricity supply in Scotland is by private companies who are supplied by private companies who distribute via private companies. So you model not only looks ridiculous but would require massive public cash to buy out these ventures. Turkeys will not vote for Christmas and these companies will not give up their substantial profit making ability to join some coop scheme punting energy below the market price. (You) Why would the investor do that? Because the market price has gone up and he wishes to realise his profit. (You) Not if he is going to sell at below the market price it wont! It would help if you actually understood there is a difference between a physical market in energy and a financial market in energy. (You) As you say Scotland is not Denmark, furthermore electricity supply in Scotland is by private companies who are supplied by private companies who distribute via private companies. So you model not only looks ridiculous but would require massive public cash to buy out these ventures. Firstly, what part of the Local Energy Company proposal do you not understand? Secondly, existing private energy companies have every interest in participation because they may source finance capital more efficiently via ECOs than through any other funding. ECOs are a new asset class which would be open to the public. Why do you think the State would be involved? (You) Turkeys will not vote for Christmas and these companies will not give up their substantial profit making ability to join some coop scheme punting energy below the market price. Since the outcome from sharing a surplus with other LEC stakeholders is superior to extracting a profit at their expense (and it is) then they will of course participate. Would they rather have 100% of nothing or a smaller %age of nothing? Do you have a vested interest to protect? Or are you just trolling Bella Caledonia? I have no vested interest although I have clients who do and they do not support your proposal. In most cases the small generators will have already accessed capital to build the asset otherwise the would not have anything to sell so I don’t really see how it would benefit them. I did not mention state involvement. And no I am not trolling Bella. As Mr Ed will tell you I regularly comment on here usually to point out the opposite side of the argument. You on the other hand might have a vested interest? Small hydro is dead for now with very few schemes planned or likely to come to fruition because of the FiT levels. That boom had come and gone. There are a few wind farms and turbines still on the go but in the main the investment is by the big guys who I don’t think would be interested in this hare brained scheme. But your response is fairly typical of an Indy type trying to insist that those of us who favour the Union don’t understand. We do – in spades. At the end of the day this does nothing to create any thing of substance which will persuade people that Scotland’s currency issues have been resolved or indeed to create wealth for Scotland as a whole. All it will do is prop up private energy suppliers and perhaps provide capital to enable them to pay their borrowings earlier than planned. But at the end of the day the consumer will still be paying inflated prices for energy to subsidise these suppliers. The cost of energy at the consumer end of the market is what needs addressed to remove fuel poverty. That what would be a scheme worthwhile having. However as that is clearly not in your plan as these nasty consumers might consume more then I think it will be a non starter. Thanks for your feedback. I note you act as an agent or adviser to clients whose support is conditional on their understanding, which in turn is conditional upon YOUR understanding. I shall assume, after a bad start, that you are being objective in your responses. I presume you refer to debt capital or perhaps in the case of Community Benefit schemes to interest-bearing shares. In both cases compound interest paid over a period of anything up to decades gives rise to a massive financial cost, frequently doubling the cost of projects. The ECO offers a return linked to or denominated in energy. As someone clearly familiar with the field, you will know that literally $ billions are invested in US passive funds on this basis, albeit this investment is made via futures markets or exotica such as Master Limited Partnerships. Good for you, provided you maintain a civil tone. I am semi-retired these days, and am a Senior Research Fellow at the Institute for Strategy, Resilience & Security at University College London, where I have researched and developed legal design of social and market institutions and instruments I advise governments in respect of energy strategy and policy: I am also a Director of Linlithgow Community Development Trust (pro bono) and I also work with enterprises of all types in relation to legal design generally and Fintech specifically. I do so on a risk/revenue/cost sharing partnership basis. So if anything I think I probably have less of a vested interest than someone who represents clients. My conversations with a couple of manufacturers indicates considerable interest in the provision of solar, wind and heat as a service, because in this model they and communities will participate alongside development financiers in development uplift. Because of the high proportion of civil engineering, hydro schemes are more problematic. “But your response is fairly typical of an Indy type trying to insist that those of us who favour the Union don’t understand. We do – in spades. I suggest you re-read the proposal. It has precisely nothing to do with any Union, be it European or UK. The ECO is not issued by any state, whether Holyrood, Westminster or even the ECB, still less by private banks. ECOs are issued by local energy producer members of Local Energy Companies and will be purchased by energy investor members. We currently pay inflated prices to feed rent-seeking middlemen, particularly developers using a rapacious transactional model.. The ECO proposal enables development as a service and will strip out economic rent (aka something for nothing) in favour of stakeholder investment, while cutting fuel costs through smart combinations of energy efficiency, heat pumps and renewable energy supply. But while the price of energy services will indeed be maintained at levels incentivising savings, an energy dividend of ECOs will be paid as of right which will give the fuel poor the means to pay without resorting to energy credits doled out demeaningly through means testing to be doled out by Food Bank charities. By monetising energy the ECO incentivises consumers to use less. With respect, I suggest you re-read the proposal and my comments and reflect on what is in it, rather than what on a hurried reading you believe appears to be in it. In summary, I am not a nationalist, and I regard nation states as obsolescent. I am less interested in political independence, than in functional policy independence (energy, housing, care food, health independence etc ) funded and delivered at the most appropriate level by networked cooperation. I am quite happy to work with anyone interested in delivering optimal policies for independence. Sounds very like Technocracy or a variation of it am I wrong ? Astute observation. Technocracy is indeed centred on accounting in energy. If you got to the end you would see I recognise that while accounting in energy is necessary it is by no means sufficient. “However, while focusing exclusively on objective energy cost may be the dream of technocrats, it leads to nightmares for everyone else. So while score should be kept of finite physical resources in objective energy terms, the minimisation of human cost and the maximisation of happiness, beauty, care and amenity requires subjective measures. Independence is not about policy: it’s about where policy is decided, and as I like to say, West Lothian Questions have West Lothian Answers. Beginning with West Lothian Energy Questions, and moving on to Housing, Food, Care, Health etc questions. Yamani would know all about the Stone Age, beheadings confirm this! Yamani is a very civilised guy who has lived in the UK for decades. The current Saudi government is another matter. I don’t get it. This sounds like a proposal for locally-managed energy producer-consumer co-ops but with the names of things changed. “A Local Energy Company is not an organisation – there are enough of these already – it’s simply an agreement between existing local stakeholders to create new energy infrastructure” — that is an organisation, even if that organisation is a temporary committee or joint venture. “Energy service users and investors delegate development & management, while retaining veto rights of governance” — so like shareholders, but with more effective power, so more like co-op members. Is the idea that these ECO things would be issued to residents to pay for their power? And is it like one of those local purpose-specific currencies like Bristol Bucks or or Totnes Tips or whatever? But with “fintech” / blockchain magic layered on? I’d really like to understand this idea better. Indeed a Local Energy Company is essentially a Co-op of Co-ops. It brings together a Co-op of energy consumers; a Co-op of energy producers and a Co-op and a Co-op of developers/managers/administrators. Otherwise known as a ‘Platform Coop’. The LEC holds the energy infrastructure in common for the benefit of members, but otherwise does not do anything, contract with anyone, or employ anyone. So in my view, as an institution it is better seen as an agreement to a common purpose rather than as an organisation with a life, agenda (and of course management) of its own. The idea is that the LEC would invest in reducing consumption (the really low hanging fruit, because savings are made at the RETAIL price) and in new local renewable energy production, particularly heat and power. The aim is NOT to provide cheaper energy as a service to consumers – since that encourages wasteful consumption – but rather to provide the means to pay. An Energy ‘Divi’ ( Co-ops again) will therefore be paid to consumer members in ECO, which they may use to pay their energy bills. The new wave of local Transition currencies are actually based on deposits of £ sterling almost exactly like Scotland’s banknotes issued by RBS etc. So for every Totnes Pound issued there is a deposit of a Bank of England Pound. While this does have the benefit of keeping value local it does nothing to create new local value. Thanks for the response, I’ll be reading up on this. I don’t pretend to understand this model, although Sid Meier’s Alpha Centauri had an economy based on energy rather than currency. So instead of the monetary running costs, everything was calculated in energy running costs. This tied the economy much more closely to the physical world. There were also opportunities to spend excess energy by speeding up certain productions and processes (I think), which is also somewhat realistic, assuming that the default rate was the most energy-efficient. In fact, there seemed to be an assumption that an energy-trading-based economy would lead naturally to energy efficiency. Also the Star Trek economy. This approach is indeed about energy accounting (keeping score of transactions in energy terms), which is a technocratic approach. As I concluded, we also must take account using other metrics such as beauty, amenity and of course happiness……but these are more subjective measures of course. @Chris Cook, I take your points. In Alpha Centauri, energy wealth could be created by working in harmony with the alien ecosystem or exploiting it by (for example) driving boreholes into the crust which piled up negative effects over time. Such a system, I suppose, could be abused irrationally (cheap renewal energy used to extract expensive fossil fuels) or rationally but with negative effects, like producing low-energy pollution. I suppose energy is fairly ideological in our global culture. The exploitative mindset contends with the environmental. Energy systems are just part of the natural biological and physical world. You would need to factor in other cycles and systems to achieve rational policies. Although I think that if you took an energy accounting approach inside a framework with other objective things like material conservation, climate protection and biological diversity, you might at least steer towards solutions like minimising wasteful activities such as commuting and the globe-crossing transport of ingredients which was highlighted as absurd in the old Food Miles Report. If one generation left the next with more usable energy on sustaining principles (with greater technological efficiency) without trashing the planet, that may be an objective policy goal that supports the subjective goals you describe (which should anyway have at least basic international legal protection). Or interplanetary legal protection, if we consider a scaled-up version of planetary economies as we may see on Mars (or lunar economies on the Moon), where limited resources like water will need to be exceptionally well-managed. I read that the bringing of electricity to the Highlands by the North of Scotland Hydro Electric Board in the 40’s & 50’s was accomplished without any cost to the UK taxpayer. The great Tom Johnstone led the way on this enterprise. I’d be interested to know how that was achieved. All those massive dams in remote places, employing thousands of workers and building a new energy infrastructure from scratch. Today we can’t even build a school without the poor taxpayer forking out five times its cost on PFI payments (and we’ve no guarantee it won’t fall down tomorrow). The Denmark example shows what is possible if we put the nation’s long term interests at the heart of planning. Here in good old Blighty the first priority of any big civic venture is that someone must get very rich, very quickly. Beyond that? Who cares? I suggest you go back and re-read. North of Scotland was wholly nationalised company in a nationalised industry which was formed to buy up some existing local supply companies at taxpayer’s expense and to develop hydro as part of the nationalised supply not only for the north of Scotland but ultimately to provided energy via the national grid to other parts of the UK as well. All of the infrastructure investment was financed via loans paid for by the taxpayer. The increased outputs which came after the infrastructure was installed eventually brought in sufficient revenues to bring the company to a break even point in operating costs. When the industry was privatised in the early 90s one of the drivers behind this was the need for substantial investment which Thatcher and her government said could not be afforded by the government and taxpayer. Since then all energy companies have enjoyed substantial subsidy albeit on a falling trend on top of the revenue they fleece us the consumer for. So the reality is we the taxpayer are still paying for the privilege of having energy from assets we paid for in the first place but sold on at knock down prices on the pretence we would get cheaper energy if the infrastructure was in private hands. I do know that Churchill was very supportive of Johnstone’s ideas and gave him a free hand. He was grateful to Johnstone for being such a competent Scottish Secretary during the war. I think I understand this. Essentially new electricity developments fund themselves buy issuing future contracts to supply. The investors put in money and take out futures, which they then sell to consumers. A possible weakness is that if the company fails, then the contracts wouldn’t be honoured. That coukd be the case for mor high-risk investments like tidal or wave. Consumers may therefore not want to hold these type of contracts or only at a steep discount. Corporate investors might see this more as a bond, a fixed return on an investment, and therefore attractiven in some circumstances but not with as much potential return as an equity investment. Not quite. Firstly, costs will be minimised by inviting manufacturers of energy generators to become members of the LEC by investing their machinery in return for rights to a share of production. In other words, a leasing model with an energy return varying with performance. Other contractors will tender on an open book basis, and will be reimbursed costs, with an agreed profit margin invested. Development financier ‘Capital Partners’ will be invited to invest to cover the remaining costs. Once the project is complete, the flow of energy will commence. The project will have in place energy investors who have underwritten (‘if you build it we will come’) energy loans in ECOs, and this long term funding enables development financiers, manufacturers and contractors to take their development gains as profit or reinvest them for the long term. These ECO energy loans will be repaid through the return by consumers of ECOs (in addition to £) in payment for supply, or through repurchase from investors at periodic auctions. The risk for a development investor (which will be reflected in the rate of return) is that the development is either late or over budget, in which case he achieves less than an agreed target rate of return: if the development is early, or under budget (and everyone has an interest in that outcome) then he will achieve a greater rate of return. I believe that this simple but radical ECO credit instrument and accompanying risk/cost/surplus sharing agreements (which actually pre-date the existing system of finance capital by millennia) provide an optimal balance of risk and return, and strip out current levels of economic rent – ‘something for nothing’ – demanded by investors, managers and often by professionals. am terribly relieved that Crubag can understand all this. Sorry but I can`t …presumably because I`m too thick. I can’t see the illustration map on my iPad. It appears the size of a postage stamp and I can’t read any detail. Anybody else having that problem? Sounds great but not only does Westminster control Scotland’s energy and energy policies it has hebpower to change law that could dump this great idea in the bin of great ideas. Scottish dependence gives control of Scotland’s energy and control of Scotland’s energy policy to Scotland where it belongs and once that is done England will not be able to make laws that specifically prevent Scotland improving its energy supply. Local Energy Companies aim to achieve energy independence (and hence resilience and security) at a local level through local investment in reducing energy consumption (at the retail price), and in local renewable heat and power generation. LECs provide energy as a service to members who share cost, risk and surplus: they do not participate in the UK energy commodity market, although their members will do so. So Westminster is to all intents and purposes irrelevant to this complementary proposal. There is nothing Westminster or Holyrood could do to prevent local stakeholders making LEC agreements among themselves to build new energy producing and energy saving infrastructure and to issue, exchange and redeem ECO credits among themselves. As I have said several times, this is not an alternative approach competing with Westminster or Holyrood: it is additional or complementary to the existing system. West Lothian Questions have West Lothian Answers. Interesting that over a hundred new nations in the last 70 years have managed to develop their own currency and banking systems post Independence yet fo Scotland it will be very difficult. Bella still living in a small community who keep reinforcing their own beliefs. As I point out in the introduction, the land-backed bank-centric nature of the UK financial system binds Scotland in a way which makes it incredibly difficult to extricate themselves. That’s is why this proposal to fund energy independence (it has nothing to do with political independence) operates entirely outside the existing system.